Bike parking space requirements vary based on the type of bike parking used. This bicycle parking layout and design guide illustrates the amount of space used by bikes parked in various bike racks and bike lockers. The bike parking dimensions in this article are general guidelines. Be sure to consult local building codes and ordinances before installing bike parking. 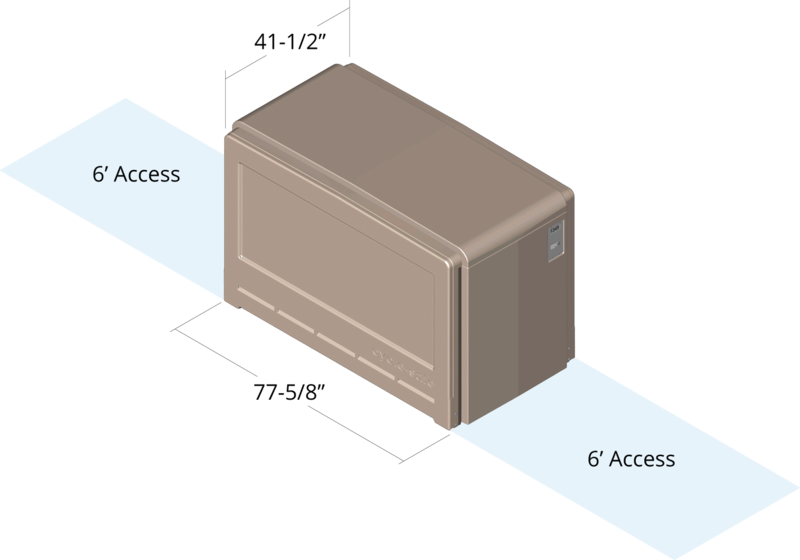 The footprint of a single stand-alone CycleSafe ProPark Bike Locker that parks two bikes is 41 1⁄2 inches wide by 77 5⁄8 inches long. A six-foot access lane is recommended for both doors. 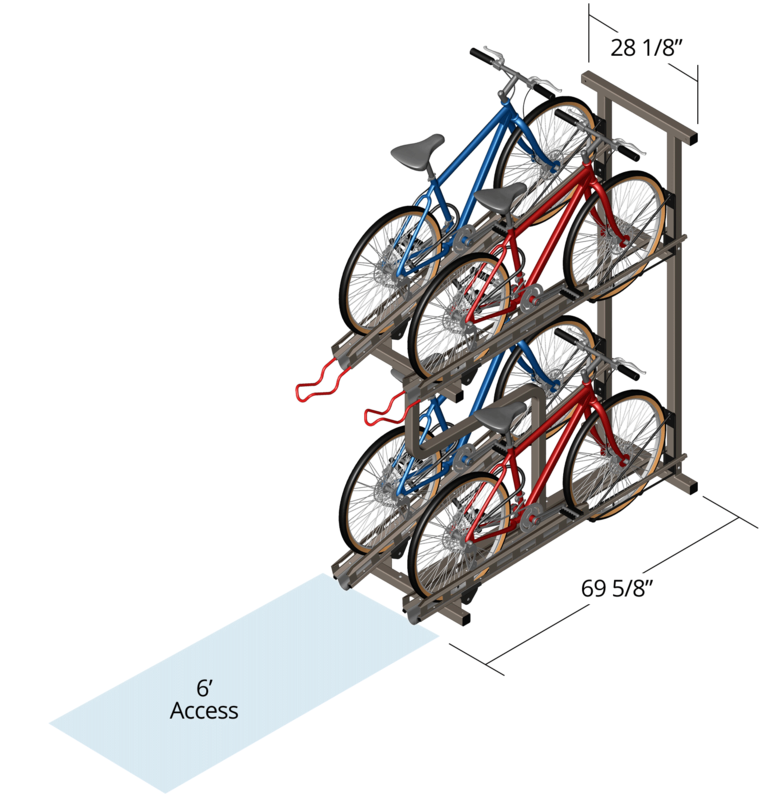 Double-tier bike lockers enable the parking of four bikes in the same square footage as two bikes. 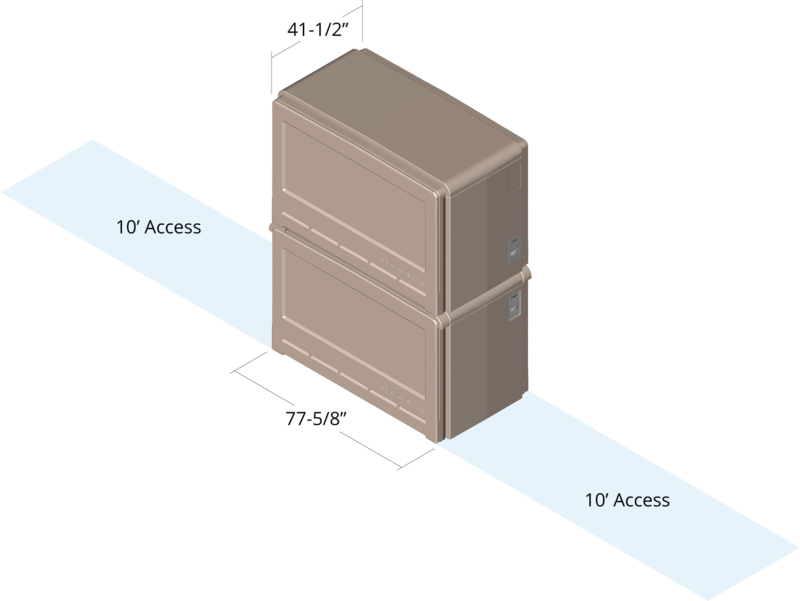 The total footprint of a double-tier bike locker is a bit larger because a ten-foot access lane is recommended for both doors. Modular bicycle lockers can be connected side-by-side to form a space-efficient locker bank. The end units are 40 inches wide. Each additional unit is 38 inches. A six-foot access lane in front of bike lockers doors is recommended. The footprint of two bikes parked at a bike U-rack is 32 inches by 84 inches. Be sure to include an access area of a minimum of 4 feet 6 inches at each end of the rack. Bike U-racks accommodate two bicycles per rack, securing both the wheel and frame. This increased stability helps prevent colliding bikes and is safer for pedestrian traffic aisles. Bike U-racks should be installed three feet apart. A six-foot walkway clearance to the street curb is standard, while an access lane between bikes in U-racks can be as little as 4 feet 6 inches. Minimum bike U-rack setback from a building wall is two feet, but three feet improves access while bikes are parked. The footprint of two bikes parked in bike wall racks is 32 inches by 40 inches. A four-foot minimum access lane is recommended. Designed to free up floor space in bike rooms, the bike wall rack parks a bike vertically against the wall. Simply roll the bike up to the rack by the back wheel and set the front wheel into the rack. Lock to secure both the wheel and the frame. Bike wall racks at a forty-five degree angle can narrow bike parking dimensions and widen pedestrian aisles. High-density bike racks are also great for bike rooms. Two-tier bike parking fits twice as many bikes in the same footprint. Four bikes can be parked in less than 14 square feet, plus the six-foot access lane. Bike shelters are often modular and can vary in size. The two-top CyclePort Bike Shelter is 76 inches by 67 ¾ inches. A bike shelter of this size can fit four bikes. Bike U-racks are often used in bike shelters for horizontal bike parking. Bike shelters can also have vertical bike parking with a bike wall rack frame. A bicycle corral is on-street bike parking the same width as a car parallel parking lane, and the length of one or two car parking spots. Paint, flexible bollards, parking blocks, or landscape elements differentiate the bike corral from the roadway. Bike parking in a corral is typically inverted U-shaped bike racks that are surface or in-ground mounted, or bike U-racks on rails. Bike corrals usually contain 5 to 12 racks to park 10 to 24 bikes. Have at least 5 feet of unobstructed clearance to utilities, loading zones, or handicapped parking spaces. Be at least 15 feet from any fire hydrant. Be at least 60 feet from any bus stops or shelters. If you have questions about bike parking dimensions, or space requirements for your next bicycle parking project, feel free to contact CycleSafe for a consultation.